This past month has been so crazy busy for me. a fever. He has Luekemia and has to be monitored closely. I have been watching my sister's 9 month old baby for her. She sent this text to me. It made me smile. 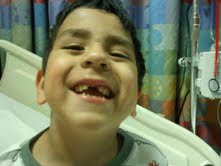 Alex- "does the tooth fairy come to the hospital too?" My Sister Amy- "yes Alex." Alex- "well don't let her take anymore teeth.....just the one under the pillow." Thanks for making me smile Alex. Get better soon and come home. I love it Kelly! I didn't even know you posted it!